Canine DNA contains two copies of a gene that most dogs only have one of. WASHINGTON -- Heidi Parker chose her pet basset hound "Stormy" because short-legged basset hounds have a reputation for being comfortable, cuddly couch potatoes. Now Parker -- a geneticist by trade -- has figured out why these and some other small dogs have such stumpy legs. Their DNA contains two copies of a gene that most dogs only have one of -- the second copy is an old version of a gene borrowed from wolves. Normally, this gene turns on when a dog is growing in the womb to make a molecule called a growth factor that guides the proper formation of limbs and paws. But two copies give the developing dog a double dose that shuts down cartilage growth at the tips of limbs. 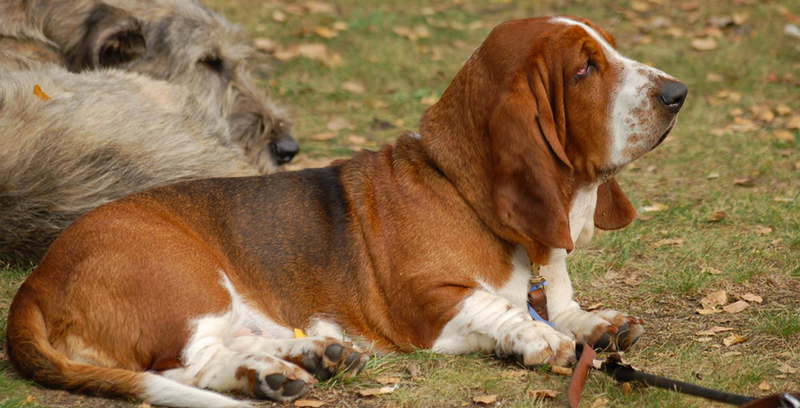 Basset hounds belong to a group of more than a dozen types of dogs deliberately bred to have these disproportionate legs, according to standards set out by the American Kennel Club. The short legs of dachshunds, corgis, and Pekingese are considered ideal for the way people once used these dogs. "The dachshund was bred to hunt badgers and go down holes," said American Kennel Club spokesperson Lisa Peterson. "You're going to need a short-legged dog to get into the holes." When Parker and colleagues at the National Human Genome Research Institute in Bethesda, MD, went looking for gene responsible for little legs across all these breeds, they expected to find a "point mutation," a small change in the DNA sequence. Mutations are the standard way that evolution produces new shapes and sizes and also the driving force behind the breeding of domestic animals. "Breeders have dipped into the toolkit of mutation when they cross individuals to get a specific trait," said Robert Wayne, a member of Parker's team and an evolutionary biologist at the University of California, Los Angeles. But instead of finding a change within a gene, the scientists discovered the doubled gene. "We found a new gene, a perfect copy of another gene," said Parker. "This 'retrogene' was a big surprise." Retrogenes are usually thought to be pieces of genetic garbage that have no function. This leftover wolf gene, which copied itself sometime between 300 and 30,000 years ago, is the first example of a retrogene known to have changed a mammal's anatomy. "This is pretty fantastic … something that affects our view of evolution," said Gordon Lark, a geneticist who studies dogs at the University of Utah in Salt Lake City. He suspects that other scientists will start looking for copied genes in the evolutionary history of other animals, both domestic and wild. Devin Powell is freelance science journalist based in New York. His stories have appeared online and in print at Nature, Scientific American, the Washington Post, Science News, WIRED, The Best American Science Writing 2012 anthology, and elsewhere. Devin Powell is a freelance science journalist based in Washington, D.C. His stories have appeared in Science, Science News, New Scientist, the Washington Post, Wired and many other outlets, including The Best American Science Writing 2012 anthology.